Yes, you read that correctly. Being born in 1985 makes a millennial, my friends. As a proud member of this generation of smartphone-staring, selfie-taking, PSL-swigging movers and shakers, I thought it was time for me to disrupt a classic part of Dungeons & Dragons: Appendix N of the Advanced Dungeons & Dragons Dungeon Master’s Guide. 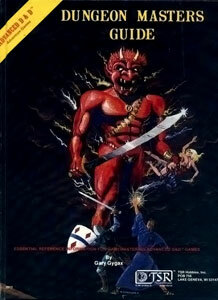 For those not familiar with Appendix N, it was a less-than-half-page section of the book that listed inspirational and educational reading material for dungeon masters from Gary Gygax, one of the game’s creators. This material included books by H.P. Lovecraft, Jack Vance, R.E. Howard, A. Merritt, and many others. Famous works of horror, science fiction, and fantasy. If you’re interested in the original, the full text of Appendix N is reproduced on the Digital Eel blog and The Tome Show has an amazing podcast called Appendix N that’s basically a book club that goes through the list. I want to know what inspires your games. There’s lots that should be on my list that I haven’t consumed. Share your inspirations in the comments below and on social media with #MyAppendixN. Great list, James. I’d add the Dresden Files series, and the Witcher novels. The Witcher novels came before the video game series. My misunderstanding of this kept me from reading them for a long time but once I gave the first one a shot, I had to read them all. I don’t read other Urban Fantasy (tried but could not get into it). The Dresden Files has such a great world built and fantastic characters and every book is better than the last. Both are rich sources of inspiration for my D&D games. Good picks! I haven’t read or seen Dresden Files nor played/read the Witcher. I’ll have to behold both! A pretty good list, but with a few critical omissions: Joe Abercrombie, Dune, Anne Rice, Harry Dresden, Hellboy, Diablo, Dragon Age, and Mass Effect. Of those I have only consumed the first Dune novel. That’s why every list is different! David Lynch’s Dune movie is a masterpiece. Flawed perhaps, but a masterpiece nevertheless. Perhaps just as important as Tolkien for my D&D games.